In-form midfielder Andrew Shinnie believes he is producing his best yet for the Hatters this term. Starting the last eight games, Shinnie has scored three goals in that time, catching the eye with some excellent displays, while Saturday’s corker against Gillingham made it four for the season. On whether he’s now at his best, Shinnie said: “Definitely, obviously the goal return it is. “The first six months when I came, I thought I played really well, then as last season ended, it tailed off a bit. “I wasn’t in the squad which was tough to take, but I just feel if I get regular run in the team and keep my form up, I can play well and be a big part of the team. Part of the reason Shinnie puts his improvement down to is a slight alteration to his position, as he has moved back to occupy one of the sides of the diamond, rather than being at the tip. He continued: “The role I’ve dropped back into kind of suits me I think. “It’s a bit deeper on the pitch, so I can time my runs from deep, which I think I’m quite good at, and I can get into different kind of goalscoring opportunities. “In the 10 I can still do that, but El’s (Elliot Lee) doing really well in there and that’s a good position for him, he’s sharp. The regularity in which Town’s midfield diamond is playing together is another reason why Shinnie believes he is flourishing. 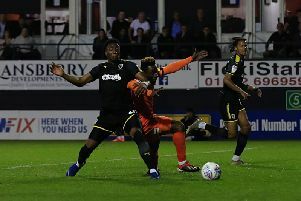 For the past five games, manager Nathan Jones has gone with Glen Rea, Pelly-Ruddock Mpanzu, Shinnie and Lee, as the Scotsman said: “It’s brilliant, we’ve got a great squad, but it’s good when you play with quite a settled team, as we all used to each other, we all get confident. “We’ve got great options on the bench, got players like Jorge Grant, Macca (Alan McCormack), Sheeze (Alan Sheehan), Pottsy (Dan Potts), all those players would play in most teams in this league’s starting 11. “The form we’ve been in, it’s been quite a settled team, the diamond, we’re strong, we know how to play it. “We work in training and it just shows out there. Glen’s been brilliant at the base of it, which allows us to go forward more. Me and Pelly know each other’s game, if one goes, one kind of stays and helps out. It’s certainly helping Shinnie become a regular on the scoresheet, now in his most prolific season since the 2012-13 campaign when he was at Inverness.